Chirps from ten species of crickets were analyzed in terms of rhythm and dominant frequency to determine characteristics of constituent wavelets from each species' chirp. This data was translated into assembly language instructions to make an algorithm that synthesizes chirps. Each cricket contains a microcontroller running at 4 MHz, programmed with a virtual 2-bit square wave oscillator that interprets data from each chirp. As the crickets chirp, calls of different species cycle with varying length, making a multi-species chorus as the calls overlap. The negligible differences between the microcontrollers' on-board clocks were exploited to cause relative phasing amongst the chirps. To keep body size small the printed circuit board was made as narrow as possible with few components. The crickets are made of masonite, monokote, paint, and electronic components. 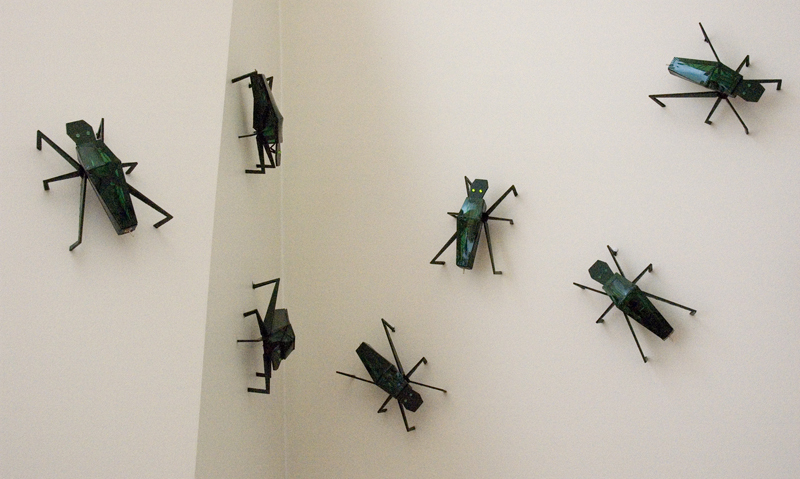 Crickets has been installed at the Weisman Art Gallery in Minneapolis, REDCAT in Los Angeles, and at California Institute of the Arts.